Daily Rate: $250 non-refundable booking fee + $500 per day + expenses for as many speaking engagements as you can set up. FYI: The record is seven. You have my permission to try and break it. Ministry Philosophy – I have never allowed money to stand in the way of ministry. If you are struggling to see your way past the costs listed above, let’s talk it through to see if we can find a mutually agreeable solution. Note: The money made from these workshops helps to offset the administrative costs I incur in the ministry. Historically, it’s been difficult to raise financial support for these kinds of expenses. Payment: Payment is preferred at the completion of my time with you. However, extenuating circumstances sometimes make this unfeasible. In such cases please have the checks cut and sent within one week of my visit. Please make sure separate checks are cut for expenses and speaking fees for IRS purposes. This breakdown will be clearly delineated on the expense sheet I will turn in before I leave. Note: Please send me a 1099 only if my speaking fees are over $600. Do not include my expenses in this statement. Workshop Minimums – When I choose to leave my family to fulfill God’s vision and call on my life I need to know that I’m making my shots count. 20 people (5 of whom must be part of your leadership core) is the minimum number I will leave home for. If this number isn’t reached one day before my visit, I will regretfully need to cancel your event. The booking fee will not be refunded, as I could have been somewhere else. You will also have to reimburse my airline ticket. If you feel like there are extenuating circumstances that might compel me to make an exception to this policy, please let me know and I will prayerfully consider this before I make my final decision. Bad Weather Policy – If an event has to be called off due to bad weather I will do my best to reschedule ASAP. Preferably this decision will be made before I leave home. Once I’ve left home all the expenses listed below will need to be covered even though the event is canceled. Your booking fee, however, will be re-applied to the new date we settle upon. Fly vs Drive: I will typically rent a car and drive within 5 hours of my home. Airfare: I book the cheapest flights (economy) possible. I will purchase flight insurance during the winter months to protect against cancellations due to bad weather. If I have airline issues beyond my control, I will do whatever I can to find another way to make the event. Regardless of what happens these expenses will need to be reimbursed due to my good faith commitment to fulfill my obligation. Rental Car / Gas: I rent the cheapest economy cars possible and add rental insurance to protect myself from any damage. Meals: $50 per day per diem (no padding). I take my actual meal expenses for the trip and choose the number of days closest to these costs as a fair and equitable way to handle this expense. Lodging: Any moderate hotel will do as “I’m a low maintenance kinda of a guy”. Assistant: Many times when I drive to a location, I travel with an assistant. They provide accountability, sell books, and handle other pertinent details. There is usually some additional expense for meals and for booking a room with two queen-sized beds. Workouts: I like to swim, play table tennis, or workout daily while I’m traveling to stay sharp. I’ve also had nine knee surgeries which require me to do this. If you have a local YMCA, my Y membership usually gets me in the door for free. If you do not, if the hotel you book for me has an indoor pool that would suffice. If not, I will pay to make this happen and list it on your expense sheet. Meet with your key leaders to discuss a specific plan of action of what you would like to see happen as a result of my visit. If your leaders are not on board you’ll need to prayerfully consider how to inspire the desire before I come in to build the skill. Have them read “God Space” and discuss it together. Lead an outward-focused conversation with your leaders. Download Outward Focused Conversation Below you will find proven ideas that spell out a best-case scenario for making the most of my visit. I have found in most cases that busy people will not put one more thing into their schedules unless they are convinced it will be time well spent. Do not underestimate the inwardly focused mindset that dominates many a faith community. I’ve found that if most of the following ideas are implemented, people will be much more inclined to make this workshop a priority. 1. Bring me in to speak one to two months in advance from the workshop date. My message will help to curb “evangiphobia” and build credibility and excitement for my workshop. While I’m in town I’d like to meet with your leadership team over a meal to help cast the vision for my visit and facilitate a dialogue that will help me better understand your context. 2. 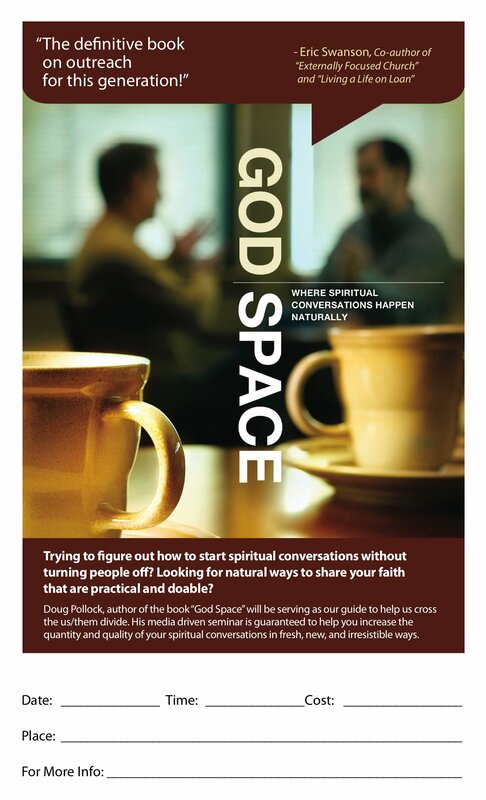 Encourage everyone to buy “GodSpace” at my author’s reduced price ($10, call me and I will send you however many copies you need) and read it ahead of time. This helps to create a buzz in your faith community by dispelling many of the stereotypes that keep people away from an outwardly focused workshop like mine. It also primes the pump for a more stimulating workshop as people walk into the room thinking about the topic at hand. If you choose not to go this route, please have people go to my website and read “Have You Wondered Into Anyone’s Heart Lately?” This will help to give your people a taste of the natural, doable, and authentic ways by which they can increase the quantity and quality of their spiritual conversations. 3. Use the DVD clips, promo-flyer, press release & photo, bulletin announcement, endorsements, and participant’s comments to promote my workshop. 4. 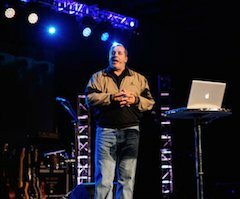 Have everyone respond to the following question, If Doug could address one thing in his workshop that would help you share your faith more effectively, what would it be? Collect and synthesize the results, discuss people’s responses with your leaders, send these responses on to me one week before the workshop date. 5. Deploy your prayer warriors! Inwardly focused people tend to have a variety of strongholds that keep them from becoming the outwardly focused Christ followers God would want them to be. The enemy rejoices when God’s people stay silent. Any plan of action that does not include prayer is shortsighted. If you are planning to bring me in for a weekend workshop, I would like to arrive on Friday in time to meet your sound technician and room coordinator so that we could set everything up ahead of time. This takes the pressure off if something needs to be tweaked and allows everyone to walk into Saturday in a better frame of mind. In most cases, I would be available to preach the next day if my workshop is on Saturday. This is another way to expose the folks who did not come on Saturday to the outwardly focused conversation. Some faith communities have me preach on Sunday morning then have me do the workshop on Sunday afternoon or evening. I have no will of my own in that matter. You know your people, so I will defer to your insight when setting the time for the workshop. 1. Workshop Needs A Sound Technician to set up the room with a large screen projector (a larger TV would work for groups from 20 to 30) a sound system, and a wireless lapel mike. See Tech Needs page! 2. A Room Coordinator to ensure I have a swivel stool, a small table just big enough for my laptop, a table for book sales, and chairs set up around round tables (if possible), so that small groups of four to six can be formed and a drink & snack table for break time. 3. An M.C. to introduce me, round people up on breaks, and make announcements. 4. A Money Collector to collect the money from workshop participants, and sell books during the breaks. 5. Following Up My Workshop Have a follow-up meeting after my workshop (announce it the day of the workshop). Discuss the big ideas that your people took away from the workshop. Discuss what organizational changes and steps need to be taken next to deepen the impact of the workshop. 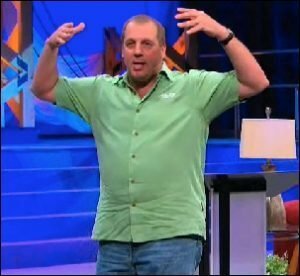 I’d like to suggest that you give strong consideration to ordering the small group DVD called “Activating God Space”. You might also want to consider my ongoing Skype coaching offer as another way to help move your faith community from information to transformation. 1. Who will be in the audience you’d like me to speak to. Tell me about your audience’s dominant belief systems, and what you are hoping to accomplish by bringing me in. 2. Where will this speaking engagement take place? Describe the room and what kind of an ambience this place has. I am somewhat of an atmosphere technician and believe that there are many factors that contribute to true communication taking place. 3. Are you open to ideas on how to reach your objective? 4. What are you willing to do to ensure that this speaking engagement is well attended and followed up? After we dialogue through these questions, I will prayerfully consider whether I’m the right person to fulfil the divine assignment you have in mind. If I believe I am, I will propose some ideas for topics then. My partnership with Group Publishing has everything to do with a similar commitment to REAL learning. I can’t say it any better than they already have, so I am borrowing their guarantee and making it mine. You can expect my workshops to be REAL. Why? Because different people learn in different ways, so you can expect my workshops to include a variety of methods to move people from information to transformation. That’s my REAL guarantee! Relational – When God’s people get a chance to express what has been impressed by way of a dialogue, they learn better and retain more. Experiential – When God’s people are given an opportunity to experience a teaching directly they tend to get it quicker and hang onto it longer. Applicable – When God’s people are given practical, doable “baby steps”, they are more inclined towards life application. Learner-based – When God’s people are exposed to a “REAL” learning environment, the greatest potential for moving from information to transformation is achieved. Effective learning starts where the learner is, not where the presenter would like them to be. * Do not push people into action beyond the capacity of what their heart is ready for. In most cases, if you do, they might participate on the outside, but on the inside, they will resist the notion of this becoming part of their overall lifestyle. * Never underestimate the aversion people have towards outward focused living. You must help them work through their issues. Their heart is the heart of the matter. When the heart is right, the feet will follow, if there is a well-defined path that is practical and doable. If your people are not moving, it’s time to stop and find out what the heart issues are. The following represents the top 10 questions Christ followers ask me in my workshops. You must address these if you want to see your faith community move past their inward focused inclinations. 1. How do you start authentic spiritual conversations without turning people off? 2. How do you reclaim missed opportunities to share the good news? 3. How do you overcome a fear of rejection and/or failure in evangelism? 4. How do you know when someone is ready? 5. How do you reach someone who doesn’t want to hear it? 6. How do you repair evangelistic bridges that have been burnt in the past? 7. Is it wrong to have an evangelical agenda in my relationships? 8. Who are we to declare to others that our God is better than their God? 9. I’m afraid they will ask me ?’s I won’t be able to answer; what do you do when this happens? 10. Evangelism is not my gift, so why do it? * Don’t teach it without doing it! Jesus trained people in the ministry, not for the ministry. In most cases, long-time believers have had way too much teaching without any application. Nudge them out of the nest to create a hunger for more. Jesus modelled this when he sent out the 72 in Luke 10. * Watch the language you use because it will shape the way your faith community looks at outreach. Anything that creates an “us vs. them” mentality or an attitude of moral superiority is not helpful in connecting with not-yet Christians. * Create a grace and truth filled learning environment where practitioners can share their successes and failures in their journey towards outward focused living. Find ways to champion the small victories people experience along the way. * While doing outward focused things in the community, always provide time for your people to express what’s been impressed on them by their experiences. Always conclude with a challenge to take what’s been learned corporately and apply it individually. If you do not, the tendency is for Christ followers to reduce outreach into an event rather than a lifestyle. Events are great for momentum, instruction, etc., but can easily leave people with the mindset that once it’s over they are done with this “outward-focused” thing until the next event. You will have to slay this beast early, and often if you want your people given to mission right where they work and live Monday thru Saturday. Leading people into a new way of acting and feeling usually requires a new way of thinking. It’s been said that you will always be what you have always been if you always do what you have always done. If you have been involved in Christian leadership for very long, you are well aware that change happens very slowly in most faith communities. If you want to microwave the process of change, I would suggest focusing on one of the big ideas from “God Space” for three months at a time. However, I have a holy hunch that you would be much more satisfied with the results from a “slow and steady wins the race” kind of mindset. If you were to spend one year on each of the big ideas in “God Space”, a greater percentage of your faith community would be apt to join you somewhere along the road in the outward focused journey. Jesus told his disciples that He had many more things to share with them but they were not yet ready to receive them. Therefore, regardless of how you go about it, don’t move on until your people get the big idea. How will you know when they get it, you ask? Whenever they are consistently sharing stories, and raising questions from their own personal application of these ideas. To facilitate a laboratory for this learning process, some Christ followers will need encouragement to venture out beyond their “Christian ghetto” by joining a new club, pursuing a hobby or beginning a recreational pursuit with other not-yet Christians. Lasting transformation will not likely happen unless you are willing to die on the outwardly focused hill. Most faith communities have a strong undercurrent of inward-focused thinking which feels normal and comfortable. Poking at this is similar to stirring up a hornet’s nest. You had better be prepared to get stung a few times. Speaking from my own experience, if you have not come to a place of living for an audience of One, you might want to heed the words of Jesus found in Luke 14:26-30.